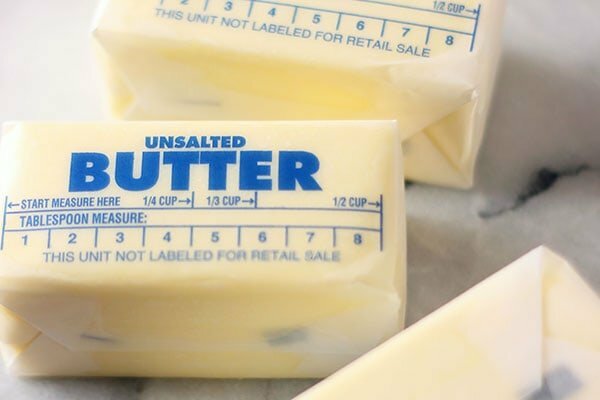 Butter vs Shortening: Which is Better? Butter vs Shortening, which is BETTER? 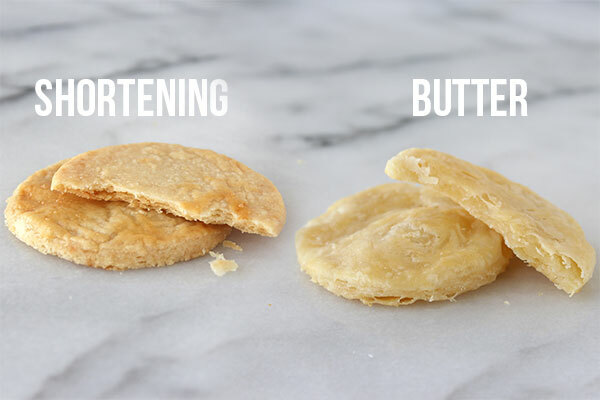 The exact differences simply explained (video included) with side-by-side comparisons in cookies, biscuits, and pie crusts so you can SEE the difference. This can be a surprisingly controversial debate and is a question I get asked about all the time. Which is better: butter or shortening? I’m going to be diving deep into the exact differences between the two, and even comparing the same recipes made with each so you can SEE the differences. It seems so simple to just substitute out one ingredient with another but baking is truly a science and every change you make can result in a totally different product! I’ve done specific testing on butter vs. shortening with pie crust, biscuit, and cookies. In the video below I’ve explained everything in case you don’t feel like reading. Let me know in the comments below if you’re Team Butter or Team Shortening! Butter is composed of at least 80% fat (per U.S. standards) and no more than 16% water, plus a smaller amount of milk proteins. That water content turns into steam while baking and can increase gluten production, which can result in a crisper cookie, flakier pie crust or biscuit. Butter has a melting point that’s around body temperature. This means it starts to melt the moment it encounters heat, giving it that melt-in-your-mouth feeling we all love. For cookies, this also results in more spread and a flatter cookie. •	Provides an excellent incomparable taste. •	Butter offers a melt-in-your mouth texture. •	Butter can be expensive. A fat that is solid at room temperature and typically made from vegetable oils. It used to be commonly made through a process resulting in trans fat, but now that we know how trans fat negatively impacts our health it can now be manufactured in a way that results in saturated fat instead. Basically, it is a cheaper and more shelf stable butter substitution. Shortening is 100% fat, containing no water. That means no steam is created during baking which effectively reduces gluten production, so shortening cookies tend to be softer and more tender. Also, shortening has a higher melting point than butter, resulting in taller cookies. Because there is no water, most brands of shortening will recommend you add in 2 tablespoons of water for every cup of butter that you’re substituting with shortening. •	Shortening is cheap and has a long shelf life. •	Cookies made with shortening are tall and tender. •	It can be easier to work with than butter which can quickly get too warm. •	Can’t compare to the flavor of butter, even if the shortening is “butter-flavored” (nothing is as good as the real thing). •	Lack of water leads to a more crumbly texture. Shortening’s higher melting point results in a taller cookie. However, it also means that it doesn’t fully melt in the mouth like butter does, leaving behind an unpleasant waxy coating on the palate. 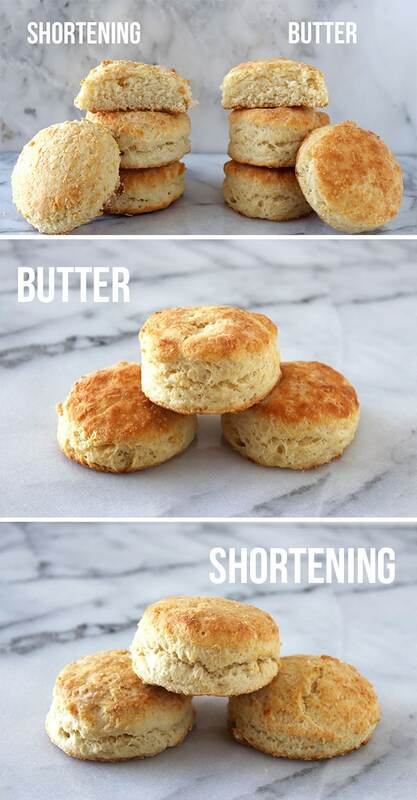 I personally prefer butter over shortening and rarely bake with shortening. I just like to use natural ingredients when possible. That waxy coating I just described is exactly why I don’t like to use shortening in recipes like buttercreams or icings where that waxy feeling is super obvious. 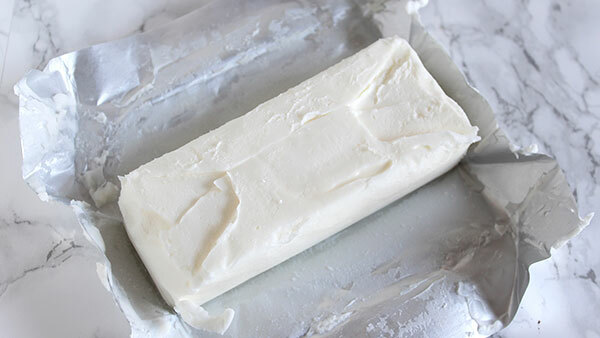 Sure, buttercream made with shortening won’t melt if you’re serving cake or cupcakes in a warm area, and it’ll remain stable for longer, but that’s not enough to sacrifice the better texture and flavor butter offers. However, I do like the height and tenderness shortening lends in cookies. That’s why I would suggest using 50% butter and 50% shortening – or some similar combination – to get the best of both worlds if you’re baking cookies. However, when it comes to pie crust and biscuits, I prefer 100% butter. Shortening can be a great option for people who can’t eat dairy or who subscribe to a vegan diet. I hope you found this insightful! Which do you think is better? Leave me a comment and let me know what you think. I found your blog by google-ing “recipe for german chocolate cookies”. I’ve seen lots of recipes, but yours totally look the BEST and I’m hoping to make them soon. I also added your blog to my favorites to follow it. THANKS! I am glad you chose butter. I haven’t used shortening in years. Love your blog! an interesting post as usual. However, under the cons for shortening, people should remember that a product may be labeled as having no trans fat, but may still legally contain up to 0.5g of trans fat per serving. And if you are like me and can’t stop with one cookie, etc., that “per serving” qualifier gets kind of meaningless. Really good point here, Patty! I’m an unsalted butter baker for the most part with occasionally using half butter- half shortening in some cookies. Your videos are very informative. Thanks! As with all of your videos, this was very informative and helpful! Thank you so much. Happy to hear that, Sally! I’m all about the BUTTER now! LOVE this informational and educational video! Thank you Tessa!!!! I totally love your blog! This was interesting. I haven’t used shortening in a recipe for close to 25 years now. Firmly on team butter. Can’t stand the taste or feel of it in my mouth. (Shudders) One day, some 5 or 6 years ago, a lovely young lady came to work with a large covered tray. She was excited to share with us her grandmother’s frosted cupcake recipe. She had made them the night before, completely from scratch including the frosting. She knew that I baked and wanted to get my opinion on them. So she stood there, anxiously scanning my face as I bit into one. All I can say is that I deserve an Academy Award or at least a medal of some sort! The frosting was nothing but shortening with powdered sugar and flavoring. The batter had shortening in it as well. Blah! Ick! Yuck-a-doo! I needed a tounge scraper, toothpaste, toothbrush, mouthwash! It was awful! BUT, I smiled, told her they were lovely and wasn’t it wonderful to have these old family recipes. Then I thanked her, excused myself, went to the ladies room and was sick. Lol! So, yes, firmly team butter! Haha!! I know just how you feel. Once in culinary school I had to scoop shortening from a GIANT container of it and ended with with greasy shortening all over my hand for the entire night. It just wouldn’t come off completely! So gross! I also love to use Ghee instead of shortening. My pie crust asks for shortening and butter, I use Ghee and butter and whow, the crust turns out super tasty and doesn’t burn easily. That’s so interesting, Caroline! I’ll have to give that a try. As you pointed out, the choice is based on what effect you are trying achieve. In most pastries where the flavor and lightness are expected I use unsalted butter. In some breads where shortening is used I will go with either oil or shortening. With cookies and pie crusts I tend to use a 50-50 mix because I want the butter flavor and lightening as well as the thicker structure provided by shortening. Thanks for your efforts in educating us. I find your articles quite useful. BUTTER, BUTTER, BUTTER! I’m trying to get away from artificial foods in my diet, as convenient or cost effective as they might be. Besides, flavor trumps appearance any day and the effect on appearance is usually very minimal. YAY Butter…nothing compares when it comes to flavor and the fact that it’s natural! Anything with a shelf life of “forever” and probably can survive a nuclear holocaust without consequences I, personally, don’t want to put in my food no matter what it can do over butter ~ LOL! I’ll “put up with” the LITTLE differences and ALWAYS go with butter! So glad you did too, Tessa! You’re my baking hero so I would have been disappointed if you hadn’t!!! I love all your videos and baking tips, Tessa! Would you consider comparing butter and coconut oil? I have only tried it in a few baked goods and find it to spread like butter, but be flat like shortening.. Have you used it much? Thoughts on other fats, like lard? I’ve only ever made tortillas with lard. I’ll have to experiment some more! What do you think? Thank u for the great video and useful information!!! If I’m doing the 50/50 butter shortning for a cookie recipe will I need to add extra water or egg to compensate in a recipe that originally called for all butter? I don’t think you’d need to! Your Ultimate Chocolate Chip Cookie Guide was probably the post that brought me to your blog in the first place! Generally I prefer butter for all my baking need. The flavor and browning qualities once it is baked is incomparable to the goods made with shortening. You are correct, sometimes shortening is necessary. I have made cookies in the past for someone who couldn’t eat dairy and used coconut oil because I didn’t have shortening on hand. It made a soft, fluffy cake-like cookie–not my preferred texture but not bad in the taste department. Thank you Tess. I always thought butter was better and still do, but the shortening cookies look better. Tessa: GREAT video and excellent information! I definitely lean heavily to the butter, butter, butter side, except with my pie crust recipe, which is 50/50 and makes THE most gorgeous, flaky, delicious crust in the history of EVER. Thank you for sharing such great tips with us. I would not miss one of your posts or videos! Hugs, girl!!! I went to Utube and had sound, I turned off for a while …didn’t help. Hopefully later I can hear what you have to say. I’ve been baking for many, many, many years and I just learned so much from this video. Thanks for all the info you share a well as the wonderful recipes. So happy to hear that, Myrna! Thanks for watching! A devotee of all natural butter. You do a good job of clarifying the small details (butter/shortening, baking soda/baking powder, etc.) that are can really change the outcome of a recipe. Your cookie e-book is great. Thank you for providing this information. I much prefer BUTTER. I haven’t used shortening in years, and am not sad to admit it. Thanks for your comparisons—it made my day!!! Thanks for all your tips and recipes. Team Butter all the way! My Gran is the one who encouraged me & taught me the art of baking. She always said use the best ingredients you can get as they translate into the best tasting confections you can give. Thank you for the great video explanations in butter v. shortening and baking powder and baking soda. It was very helpful. I have tried many of your recipes and been really happy with them. Recently a friend gave me a recipe for Armenian sugar cookies that used clarified butter, sugar, and flour. While her cookies were delicious and melted in your mouth, I could NOT get the cookies to hold their shape when baked. They went flat and the sugar did not incorporate and dissolve: My friend used ghee which she refrigerated first. I did the same and after three failed attempts, gave me up. The recipe said to beat 1-1/2 cups clarified butter till almost white; add a cup of sugar and beat again. Then add spoonfuls of flour (2 cups) and kneed 3-4 minutes to dissolve the sugar. Roll by handfuls into “ropes” of dough about the size of a nickel and bake at 325 degrees for 15 minutes. It also said you could chill the dough for 5-10 minutes for easier handling, which I also tried. I’m an experienced baker and this has me stumped! Any suggestions or ideas as to where I went astray would be much appreciated! I much prefer butter in frosting but is there any way to get that nice white color with butter frosting? Unfortunately not really, especially if you’re using vanilla. I am all about the butter! I keep butter shortening on hand, but rarely use it. Thank you for your informational video! I just love all the information that you give in your videos. I have learned so much! I love your information. I always use butter sometimes margarine to cut some of the cholesterol. Never use shortening that is just to greasy and tasteless. Love the info on refrigerating the chocolate chip cookie dough. I am trying to make a stable frosting used in whoopie pies and or gob cakes. everything calls for shortening and i have never used it. although it seems like shortening is definitely healthier today, the thought of using a product that isn’t natural kinda freaks me out. but the thought of having whoopie pies without that great filling also freaks me out. do you have a reasonable recipe that is similar to the traditional (half shortening and half butter) recipe? I am not interested in using fluff either.